Will Roberts was born in Ruabon and from the age of 10 he lived in Neath, South Wales - where he spent the rest of his life. He worked from his studio from home and in later years, a studio in Neath town centre. Although a deeply spiritual and religious man, Roberts had never used religious subjects in his work. His friendship with JF Williams, then Rector of Neath and later Dean of Llandaff Cathedral in Cardiff, drew him to explore expressing the brutality of the Crucifixion. It resulted in several oil paintings of the subject and a powerful sequence of charcoal drawings depicting the Stations of the Cross. They were first exhibited at the University College of Swansea in 1981 and now hang in St. David's Church in Neath, gifted by the artist to the church where he and his family worshipped. They are among the finest examples of Roberts' work in the medium of charcoal. Roberts grew to love the South Wales landscape, its imperfections and what he called "the scars" inflicted on it by man. He loved the town of Neath and its environs and was active in campaigning for the preservation and conservation of buildings in the town. Its industry was frequently depicted in his work and now forms an important part of its social history. In 1993, the Oriel Mostyn, Llandudno, presented a retrospective exhibition of the artist's work, spanning 1927 to 1992. In the following year, a one-man show was the prime focus of the arts exhibition at the National Eisteddfod, held in the Neath Valley. 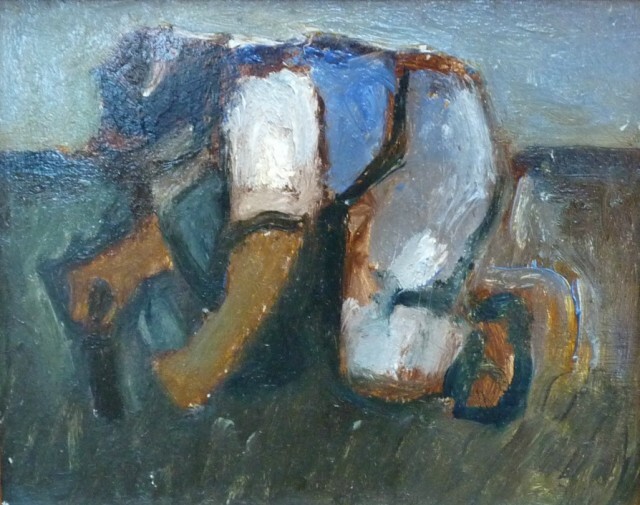 Artists International Association, London; St. Donat's Castle, Llantwit Major; Royal Cambrian Academy, Conwy; Stations of the Cross, University College Swansea; Oriel Mostyn, Llandudno - Touring Exhibition (Newport Meseum and Gallery; National Library of Wales; Glynn Vivian Art Gallery and Meseum, Swansea.